Among our graduating seniors this fall are father and daughter duo Jim and Brooke DeCesare. Jim will be graduating with his bachelor’s degree in Interdisciplinary Studies with an emphasis in Business, and Brooke will be graduating with a bachelor’s degree in Public Relations. Both will walk together during the Potter College Recognition Ceremony this Saturday. 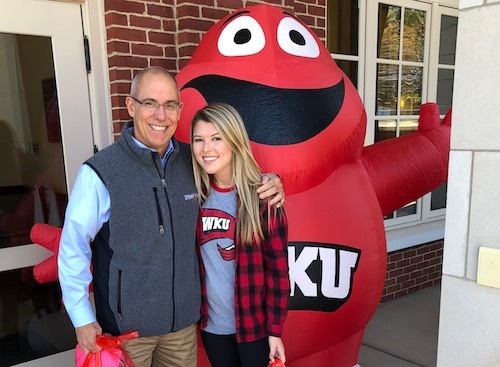 Jim said that the best part of his WKU experience has been attending classes while both of his children (son Justin recently completed the first semester of his freshman year) were also enrolled. “WKU means family to me. My personal family, who have, or are attending WKU, and the Hilltopper Nation Family. No matter where I go I always run into someone who has a connection WKU,” he said. Congratulations to both Jim and Brooke.